Since Milos, Ios and Santorini are rarely used as yacht charter bases, the best port to start your bareboat sailing vacation is Paroikia port on Paros. Paroikia is pronounced as Parikia. 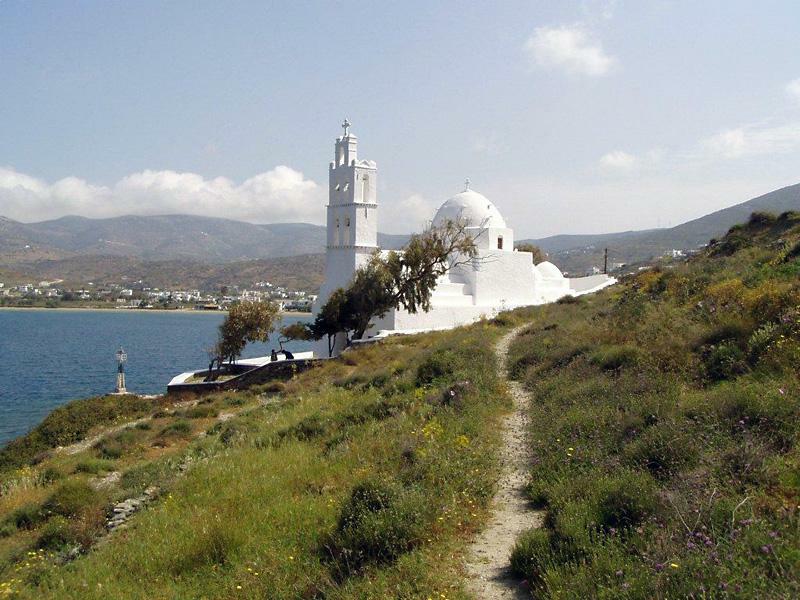 Paros island is the closest to the must-see islands listed above so a return trip would allow you to visit most of them in a 7 day itinerary in the Cyclades. Yet, to really explore all these astonishing islands you'll need at least 14 days and then one-way routes towards Paros (and actually also Syros) are possible from either Samos, Kos, Lavrion and Athens. Most reliable yacht charter companies offer yachts from either Syros and Paros into these southern Aegean waters. More routes and itineraries in the Cyclades. The typical bareboats used as charter yachts are the Jeanneau Sun Odyssey, Bavaria, Dufour, GibSea, Lagoon, Ocean Star, Hanse, etc. More on charter yachts and on catamarans versus monohulls for these Greek waters.
.: Back to Ios island :.